We have already encountered plenty of entry level gaming laptops this year, right from ASUS and MSI to more affordable options from Lenovo, HP and most recently Acer. Acer currently has two gaming lineups, the more affordable one is its Nitro range and the one for pro-level gamers falls under the Predators series. 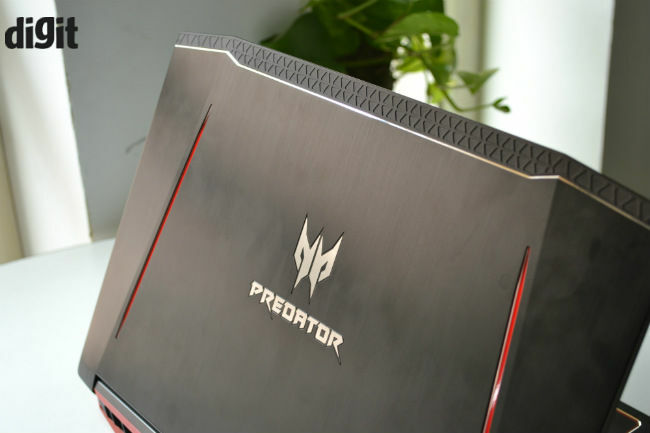 While we have already reviewed Acer’s most affordable gaming laptop, the Nitro 5, it is this the Predator Helio 300 that intrigues us more. 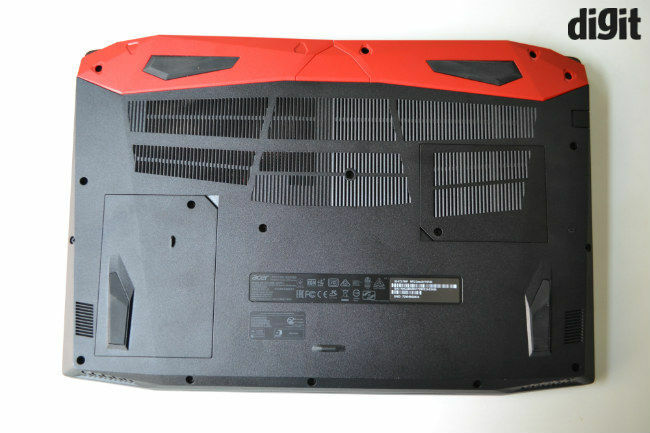 The Helio 300 is a new entry into the gaming laptop category and one of the most talked about devices at the moment. The reasons for that are many, including its relatively affordable price tag to its overclocking capabilities. The best part is that even with such high end hardware, the Helios 300 is one of the most affordable machines in its class. So, has Acer compromised somewhere else to bring the price down? Well, that’s what I set out to find out over the last week. The first thing to notice about the machine is the design and if you consider gaming laptops in the same price category, this is a good looking laptop. The choice of red and black colour theme is getting somewhat monotonous, but considering how it is being used here, the design can be called refreshing. The thing is, the Helios 300 does not look plain or simple, at least as far as its lid and back are concerned. The lid has a brushed aluminum panel atop a plastic frame that looks good, while helping to keep flex to a minimum. The red plastic inserts may not have backlighting, but they do look good and give it a distinctive look. In addition, the metal lid and keyboard deck are also made out of metal sheet, which is placed over a plastic base. The quality of plastics used does not feel as high grade as the Dell Inspiron 7567 Gaming or the Lenovo Legion Y520, but it still feels good to touch. You also get two maintenance hatches at the back, one hides a 3.5-inch SATA dock, which is utilised by the 1TB HDD. The other one is for the RAM slots and one can expand upto 32GB of DDR4 RAM. 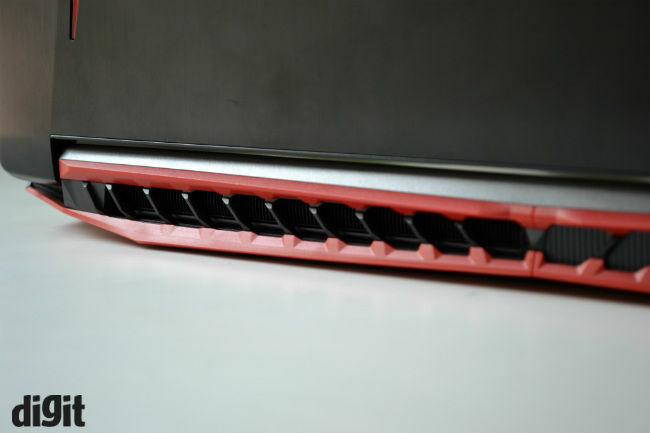 Overall, the design of the Helio 300 is strikingly similar to the Nitro 5 we reviewed earlier. It has the same proportions, weight, hinge mechanisms, keyboard, port setup and even innard layouts. However, for the Helios 300, Acer has added a metal keyboard deck and a new lid cover. This change in aesthetics is reflected in the higher price tag. On the connectivity front, you get all the essentials a gaming laptop of this genre should have. Starting from the left, we have a gigabit ethernet jack, USB 3.1 Gen 1 Type-C port, HDMI out, USB 3.0 port and SD card reader. The right side of the machine has the power port, two USB 2.0 ports and a microphone/headphone jack combo. You also get Bluetooth as Qualcomm made gigabit Wifi adapter. While all this is good, I would have appreciated the laptop more if all three USB ports supported the USB 3.0 standard, considering that the price tag is above Rs. 1.5 lakh. Moreover, the USB Type-C port should have been Thunderbolt compatible. While Acer has cut some corners on the connectivity part, I am okay with their choice of display. The 15.6-inch IPS LCD panel on the machine is not super bright, but it is just good enough to be viewed indoors. It is also not very reflective due to the matte coating. The display is better optimised than most other entry level gaming machines we tested this year. Colour saturation is decent and I had no issues differentiating colours while playing games. The 60hz cap on the display is both a boon and bane for the machine, as the GTX 1060 is capable enough for higher frame rates. On the other hand, since the display refresh rate is capped, most games run smoothly at 60fps without any issues. The keyboard layout here is the standard chiclet style. Keys are not completely flat and are slightly concave. 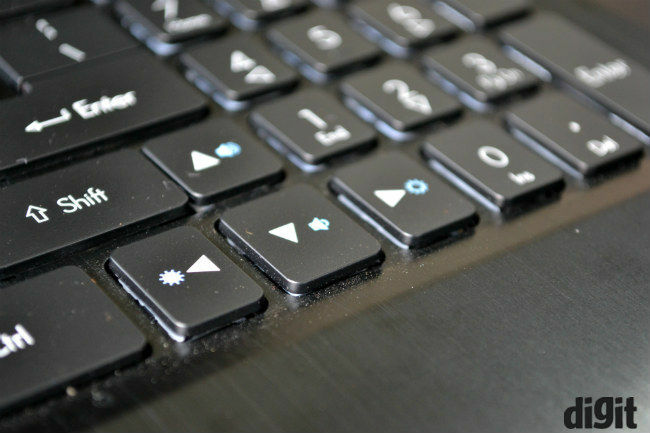 Acer has maintained the standard key size for most keys, with the numpad keys squeezed out horizontally and with smaller top row keys. They have short travel yet clear pressure points. While individual keys, as well as the keyboard layout, might take some time to get used to, once you do get in the groove, the typing experience is quite good. That being said, Acer could have done a better job with the short cut keys. For example, the volume control and brightness controls are located on the arrow keys, which could have been easily remapped to one of the empty “fn” keys. Moreover, Acer has added home, pg up, pg dn and end keys to the numpad as well for convenience, but I believe the laptop could have done without them. The red backlighting lives up to the gaming quotient, and is just bright enough to be visible under dim lighting, which is a good thing. It does not have a two step dimming feature though and you can either turn it on or off. 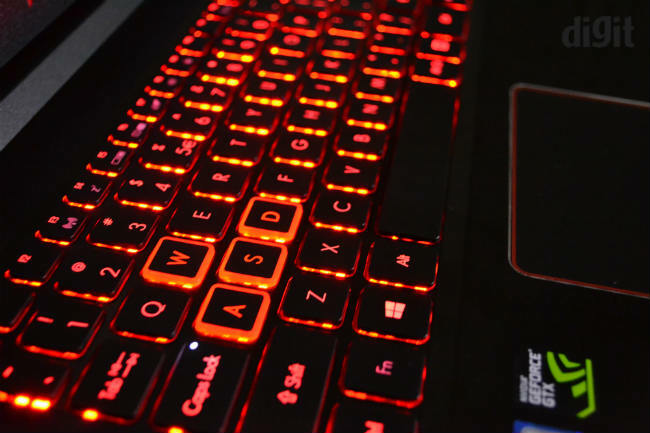 Acer could have added RGB backlighting to the keyboard, but it is again an added feature to have and not a necessity. The edge of the keyboard deck is a bit sharp for my liking and dig into the user's wrist while using the laptop. The touchpad on the other hand is quite good and simple to use. Rather than using Synaptics or any other third party touchpad mapping drivers, Acer is using Windows’ precision touchpad. 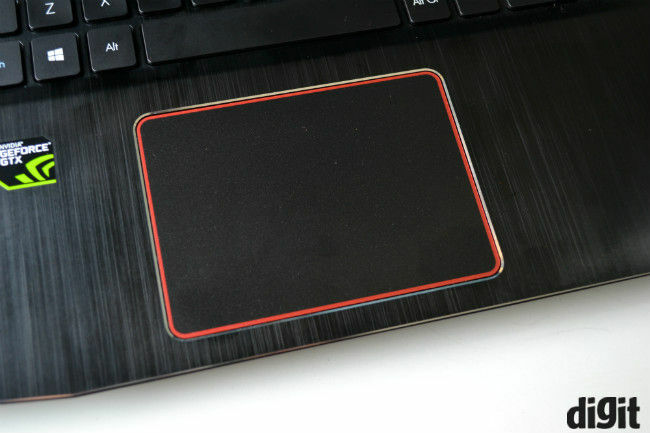 The touchpad tracks well, is precise and large enough to be used with your thumb. However, that is something most laptops in this category achieve. On paper, the Helios 300 has all the right hardware to satisfy the demands any gamer’s demands. The laptop is powered by an Intel Core i7-7700HQ processor, has 16GB of DDR4 RAM and a powerful NVIDIA GeForce GTX 1060 GPU. For storage you have a combination of 1TB HDD from Toshiba and a 128GB SSD from Intel. 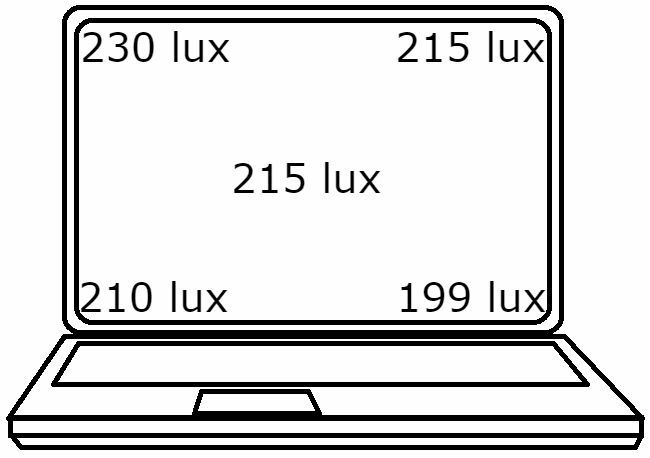 The 15.6-inch IPS LCD supports 1080p resolution and is locked at 60Hz. All this combines to offer a decent 1080p gaming experience across all kinds of gaming titles in medium/high settings. If you find the power lacking, you can overclock the GPU a bit from the Predator Sense app. This does increase the frame rates and the in-game graphic performance, but the difference is not very drastic. Still, sometimes you might need just those extra frames to hit the sweet spot, which should be possible with the overclocking functionality. 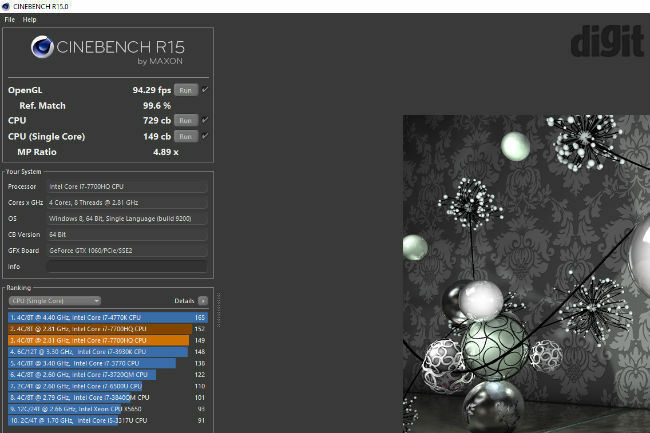 However, the increase is performance is noticeable in synthetic benchmarks. The RPM of the two exhaust fans at the back are also adjustable with the three presets offered in the Predator Sense app. However, you can just turn on CoolBoost, which will dynamically change the RPM of the fans depending on the workload. If we reiterate all these gaming capabilities into numbers, graphic intensive games such as Battlefield 1 and Dishonored 2 ran at 60fps at the highest settings. If you are into more casual games such Dota 2 or Path of Exile, expect the frame rate counter hitting above 150fps consistently, even after long gaming sessions. The cooling copes up with all this gaming well, but the laptop does get a little hot above the top row of keys. We recorded temperatures going up to 45 degree celsius right above the F4, F5, F6 keys, which we are not very happy about, but since it does not interfere with the gaming performance in any way, most users should be okay with it. The laptop also has a dual speakers, which are decent at best. It definitely lacks a subwoofer, but at least stereo audio quality is clear and without any distortions, unless you raise the volume to max. However, what matters is the audio quality via headphones and that is quite good as the laptop supports Dolby Atmos. It is a not an Acer exclusive feature here, but it still matters as in games it provides a better sense of where the sound is coming from. Gaming laptops don't have very good battery life compared to normal office laptops, and the Helios 300 is no exception either. It manages to offer 4-5 hours of screen on-time on battery life depending on the amount of workload you have. For example, if you are binging through the new GOT season, you might have to find the charger after the third episode. 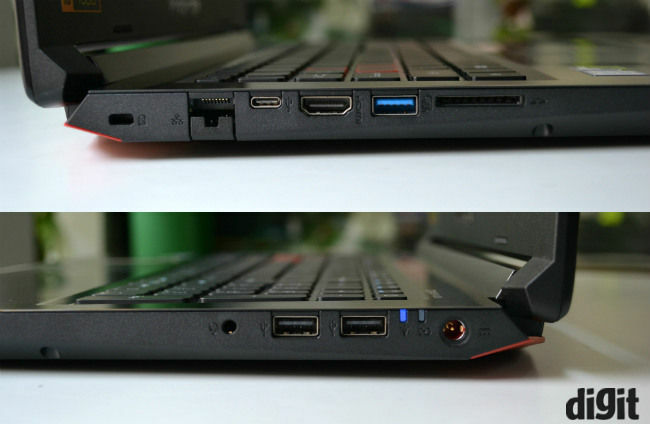 Moreover, don’t expect superb gaming performance on battery, as the laptop uses a small 48whr battery. With this you can play games like Dota 2 or Limbo on battery, but not for more than two hours. Our PCMark battery test recorded a max screen on time of 13 hours and 9 minutes, which is not bad considering the specifications. 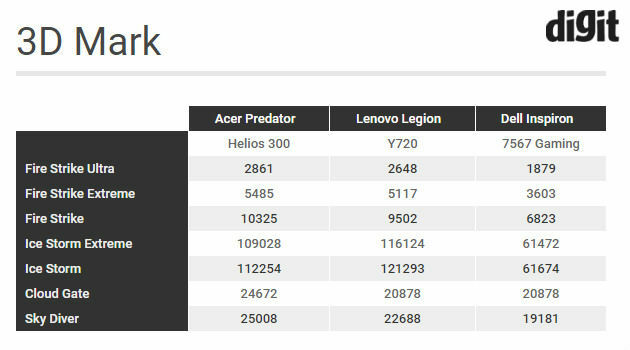 Overall, I think the Acer Predator Helios 300 is a good entry level gaming laptop for the money, but certainly not the best out there. It has a different flavour to it, considering how the keyboard and touchpad are or how well optimised the display is out of the box. 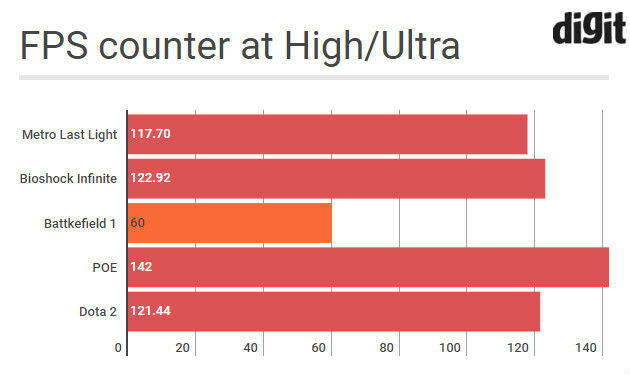 Its performance is also at par with most laptops in this category and if 1080p gaming at 60fps is all you need, the Helios 300 with the GTX 1060 will do the job just fine. 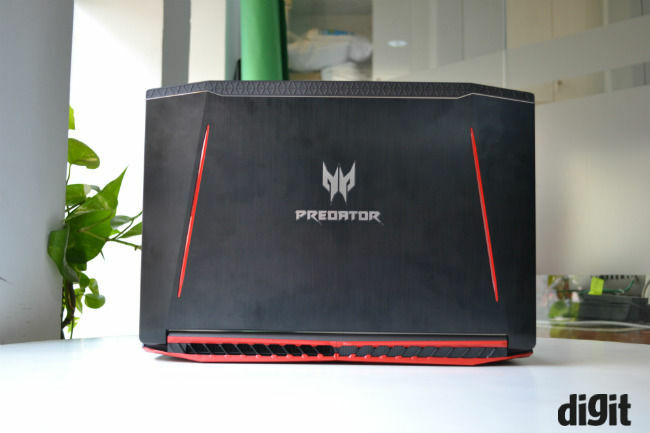 The Acer Predator Helio 300 with the GTX 1060 is priced at Rs 1,59,990. You can get similarly powered laptops at the same price or even less. The Lenovo Legion Y720 comes out to be the better laptop here, offering an RGB keyboard, better port support and an overall better design. If you don’t want to spend as much, the HP Omen 17 is a perfectly good option as well. My Acer emachines EM355 got slow.